One of the most prevalent medical threats facing the US Hispanic community is diabetes. While the disease is near 10 percent prevalence for non-Hispanic whites, Type 2 diabetes afflicts almost 17 percent of Latinos and is most common among Latinos of Mexican descent. And, even at its most treatable, the disease can affect everything from patients’ renal and cardiac health to their vision and beyond. With a Chicago Hispanic population of more than 2,070,000 (the sixth highest in the country), nearly 80 percent of which is Mexican, it’s no small task for Rush University Medical Center to meet the demographic’s treatment needs. The nonprofit healthcare, education, and research center is consistently named one of the nation’s top hospitals, according to US News & World Report, and is ranked in seven of sixteen specialties. Additionally, Rush is one of just two top-ranked hospitals in Illinois, and it has one of the highest-ranked diabetes centers in the country and a patient-education program that’s been recognized for excellence by the American Diabetes Association. However, Rush’s senior director of enterprise technologies and cybersecurity, Jesús Delgado, is working together with medical staff at Rush to prevent patients from needing such services in the first place. An engineer by training, he and his team are using data analytics, genomics, telemedicine, and even artificial intelligence to take a more proactive approach to healthcare. More immediately, Delgado has been applying different strategies to increase access to healthcare and education for the Hispanic community in Chicago. Much of that population is mere minutes away from Rush in the Pilsen neighborhood, where Delgado himself grew up after emigrating from Mexico at the age of seven. It’s at the neighborhood level that Delgado’s personal connection to the compassionate mission at Rush begins, but it’s certainly not where it ends. 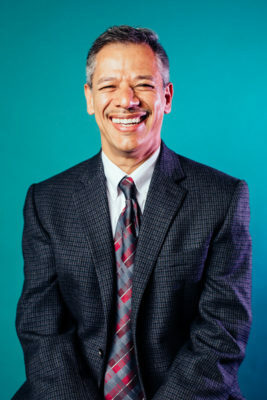 For Delgado, the connection reaches as deep as his household and family. It wasn’t a direct path to healthcare for Delgado, but it’s in this field that he’s come to find the most meaning. He cites the ability to effect instant change in patients’ lives as part of that. After twelve years at Rush, Delgado still makes sure to walk the medical campus regularly so that he can see firsthand how the technology he and his team develop is being used throughout the medical center to help save lives or improve patient care. While developing technology to help doctors prevent diabetes is only one of Delgado’s many initiatives, it represents the overall digital transformation he arrived to usher in at Rush twelve years ago. Aggregate data about similar patient populations can be brought together with a patient’s individual medical profile as well as their unique genetic data. With this, the hospital’s technology not only assists medical staff in projecting possible health problems for the patient but also can suggest ways to prevent those problems altogether. On the caregiver’s side, this makes for more robust patient data and healthier incoming patients. On the patient’s side, it makes for a smoother experience entirely, including quicker admission, more accurate diagnosis, more effective treatment, and a faster discharge. It also reduces overall costs for patients and makes healthcare more accessible. What’s the foundation for this kind of innovation? Is it the genomic analysis? The artificial intelligence? The instruments that make remote examination possible? In actuality, it’s more basic and more profound than that. None of it was possible before Delgado and his team’s implementation of an electronic medical record (EMR) system. To some people, that might sound like simply “going paperless,” but that couldn’t be further from the truth. And while it’s the EMR that makes complex data analysis possible at Rush, it’s compassion that inspires Delgado and his team’s technology initiatives. He links the usefulness of a tool to emotional intelligence, always prompting his team members to ask themselves how users feel, what is important to them, and why. Every nascent project, technology, or service, Delgado stresses, has to be created with such questions in mind. As for the future, Delgado sees further progress for himself and Rush University Medical Center. “No matter what happens with healthcare reform, the need to provide a better patient-care experience as well as develop the next generation of patient-care models will always be in high demand,” he says. Rush’s vision is still to be the care center of choice in the nation as it continues to grow its network and focus not only on providing the best treatment but the best tools for prevention as well. Meridian IT, a Meridian Group company, offers solutions and services focused on giving clients the greatest value. We deliver flexible IT solutions, managed services, multiple deployment options, and ongoing maintenance and support. Discover more about the Meridian Group Companies with locations in Europe, North America, Australia and Asia at www.onlinemeridian.com.